ARLINGTON, Va. – The Washington Capitals have signed forward Tom Wilson to a three-year, entry-level contract, vice president and general manager George McPhee announced today. Wilson will earn $832,500 at the NHL level and $70,000 at the AHL level, with bonuses. 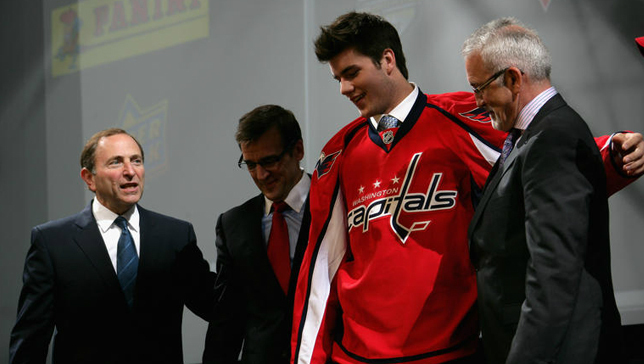 Wilson, 18, was drafted in the first round (16th overall) by the Capitals in the 2012 NHL Draft in Pittsburgh. He entered the draft ranked 15th overall among North American skaters by NHL Central Scouting. Last season he collected 27 points (nine goals, 18 assists) and 141 penalty minutes in 49 games with Plymouth of the Ontario Hockey League (OHL) and added 13 points (seven goals, six assists) in 13 OHL playoff games. The Toronto native was voted as the ‘Best Body Checker’ in the OHL’s 2012 Western Conference Coaches Poll and was a runner up for the ‘Hardest Worker’ category. The 6’4”, 203-pound forward won a gold medal with Team Canada at the 2011 Ivan Hlinka Memorial Tournament, posting three goals in five games. He also won gold with Team Ontario at the World Under-17 Hockey Challenge, recording one assist and six penalty minutes in four games. Wilson recently completed his first Capitals Development Camp last week and is expected to play for Plymouth of the OHL next season.